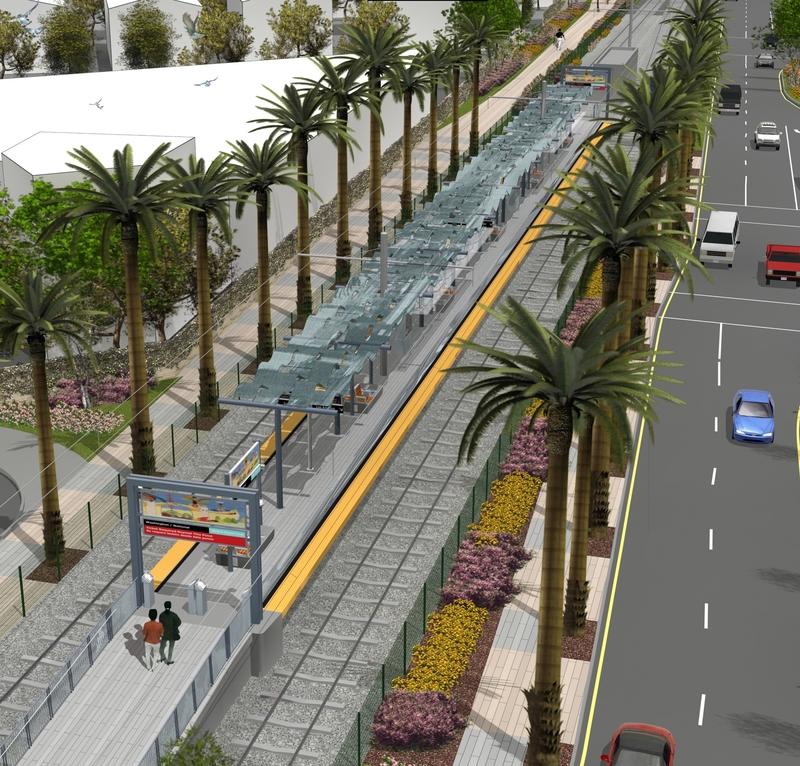 A rendering of what the landscaping will eventually look like along the Expo Line. Los Angeles, CA (February 9, 2011) – Expo Line crews started planting trees and other landscaping today along the new light rail line as it nears completion from downtown Los Angeles to Culver City. The landscaping elements are part of plans to develop a multi-modal corridor that integrates transit, a bikeway, and pedestrian areas into a safe and balanced parkway setting. With its native and drought tolerant plants, the landscaping along the alignment will provide screening and buffering along the transit corridor and establish a parkway that connects neighborhoods along the way. “The plantings will form a continuous, green, linear park and establish each station as a place, with a unique planting color and atmosphere,” said Roland Genick, Lead Urban Designer for the project. Landscaping was planned with feedback from the Urban Design Committee whose members represent communities along the Expo Line route. The Expo Board of Directors appointed the 14-member committee in 2006 to provide input on the project’s design, landscaping and station artwork. “By designing community outdoor spaces that integrate nicely into neighborhoods, we hope that Expo Line stations become a source of civic pride,” said Philip Hart, CEO of Hart Realty Advisors and Member of the Urban Design Committee. Construction on the first segment of the Expo Line, from downtown Los Angeles to Culver City, is 86 percent complete. Light rail vehicles will begin testing on the tracks in the spring, and a portion of the line is expected to open later this year. For more information about the Expo Line please visit our website at www.BuildExpo.org. Might want to check your link, cause the link to the project goes to http://thesource.metro.net/2011/02/10/new-landscaping-planted-along-the-expo-line-route/www.BuildExpo.org and not to its destination. Getting a page can’t be displayed. FYI and great article keeping us informed on whats going on. I reloaded the links and it seems to be working now. An exciting step forward for Los Angeles! I can’t wait to head over to my nearest station at Jefferson / La Cienega and board for Downtown LA. Very Exciting to hear Expo in it’s Final steps before patrons on the Westside finally have an alternative for transportation beside car, and bus. Here is hoping more articles about Expo’s completion are on the way. I am curious though. I see the TAP machines at the stations entrances, will there be no more turn-styles added? The turn-styles have caused me great confusion in how they are being implemented. Is metro going towards a MUNI type system were it will be at major stations and paper passes will have TAP tech integrated in them? Anyways way off topic but are the questions that these articles do bring up in my mind.